Individual bright and bold packages clearly show the unique process used to mix powder and liquid for a custom fit. 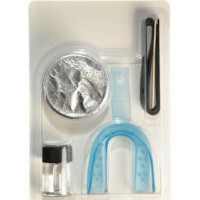 Easy to use and molds perfectly to the contours of each tooth. Fits all ages. $100 per tooth dental injury warranty. Individual bright and bold packages clearly show the unique process used to mix powder and liquid for a custom fit. 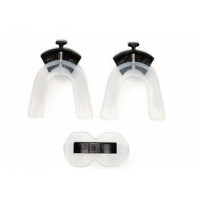 Easy to use and molds perfectly to the contours of each tooth. Includes Flexo-Release strap with revolutionary "T"-slot design. Fits all ages. $100 per tooth dental injury warranty. Great for boxing and martial arts. Upper and lower teeth and jaw protection, extra large breathing hole. 30-second custom fit.